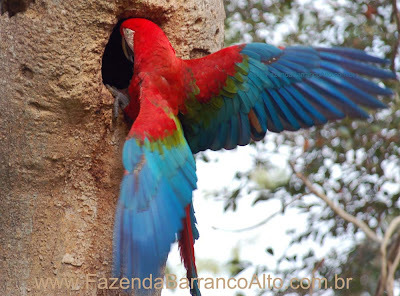 Now, end of winter, is the time that most animals courtship, display, mate, breed and nest ... including the magnificent red-and-green macaw (arara-vermelha, Ara chloroptera), a bird we see daily but can't get enough !!! Mostly they nest like hyacinth macaws (arara-azul, Anodorhynchus hyacinthinus) in mandovi (Sterculia apetala) trees. 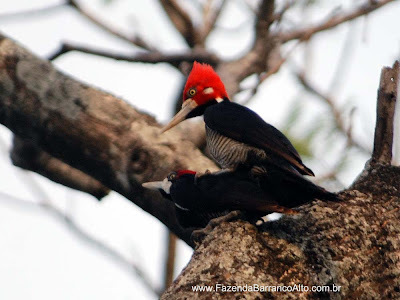 Another species caught in action is the crimson-crested woodpecker (Pica-pau-de-garganta-preta, Campephilus melanoleucos) a big and uncommon woodpecker that is of fundamental importance to other birds, like macaws and parrots, because they use abandoned woodpecker nests.